..the air is just better up there!.. need to know what the biggest tire can put on my 1995 Jeep Cherokee without modifying it! A 235/75R15 is probably the biggest you want to go. Some people go up to 30″ tires, but the general consensus is that you’ll get a little rubbing with 30s. Unfortunately, Cherokees don’t have as much clearance as Wranglers in their stock form. I have a 2005 TJ Sport, Trail Ready, with posi rear end. 48,000 km. 6 spd 4.0 lt. big 6 engine. Firestone rear air bags in coils, 1 3/4″ front coil spacers, Rancho RS9000XL shocks. Total lift approx. 2 1/2″ rear & 2″ front. Warn M8000 winch w/roller fairlead, Warn winch mount plate. 3″ Cold air intake, K&N conical filter, chipped, throttle body spacer, etc..
Trailer hitch, 1999 stock TJ mags with BFG AT/TA tires – LT 235/75R15’s (1″ smaller circumference than the stock tires – got a deal on all four of them). how large of a tire can I use without any more mods unless they are minor ones? 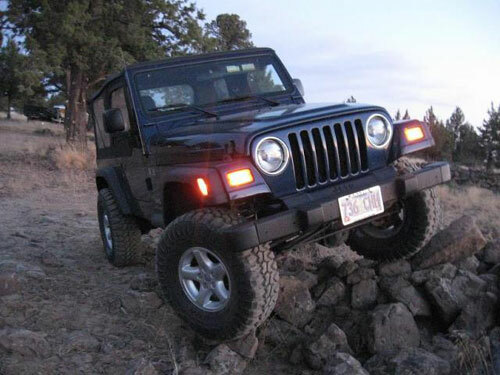 With 2″ of lift, you’ll clear 31s no problem. However, with a 10.5″ wide tire on stock TJ rims you may get some rubbing when making sharp turns. If this does happen, you can add some washers to your steering stops to eliminate the issue. I am mechanical but not a mechanic, could you give me info as to where the steering stops are please. I have an idea but want to be sure. Also what do you suggest for a roof rack for my TJ? Unfortunately, I don’t have much experience w/ roof racks, so I can’t make an honest recommendation there, sorry. I have a 99 Jeep Wrangler and am seriously thinking about putting a lift kit on it and larger tires. I off road at least once a week and I don’t have to commute far for work so I figured that a lift would do me good! I don’t have a huge amount of money to spend so I was looking into putting a 2” lift with 32×12 tires. Would those tires be too big for that lift? Also, what do you think about the trailmaster 2” Spring Spacer Lift Kit with SSV shocks? I look forward to hearing our feedback! Thank you! Does a Lift Kit Void the Warranty on my Jeep? Can You Fit 31-inch Tires on Stock Jeep JK Wheels? Can You Fit 33-inch Tires on a Jeep With a 2-inch Lift? Will Jeep TripCast iPhone App Ruin Your Favorite Trails? Is Jeep building a pickup truck? Jeep™ is a registered trademark of Chrysler Group LLC.